Replacing the electrodeionization (EDI) system at a power plant is not quite as simple as changing the batteries in a smoke alarm or installing new wiper blades on an automobile. With planning and preparation, however, technicians can install the latest version of the water purification technology in a matter of days. Power plants require deionized water as makeup for high-pressure boilers to produce the steam that drives the turbines that generate electricity. If the dissolved solids in the water are not removed, boiler tubes can experience scaling and fouling, reducing the transfer of heat and debilitating system efficiency. To prevent this damage, power producers traditionally used a combination of membrane separation and ion exchange processes to remove impurities from feedwater. This required the significant use of acid and caustic chemicals, a large footprint and regular interaction with the systems by workers and sometimes suppliers. That all began to change in the late 1980s, however, with the introduction of EDI technology. EDI combines ion-exchange membrane technology with ion-exchange media to provide a high-efficiency demineralization process. Adoption of this new technology was slow because significant pretreatment was required for early versions of EDI. Today, EDI units are common sights at power plants because technical advancements have enhanced the efficiency and simplicity of the water purification process. Nonetheless, the performance of EDI units can gradually and steadily degrade over time. That is what happened when the management of a gas-fired plant in the Midwest contacted MPW Industrial Services for the purchase and installation of new EDI technology—an E-Cell MK-3 from GE Water, now Suez Water Technologies— through MPW’s Products Direct arm. Plant management wanted to switch to the new technology during an upcoming five-day outage. To ensure the installation of the new EDI units went smoothly, MPW, Suez Water Technologies and plant management engaged in a series of planning meetings to define the scope of work and the details of the assignment. Complicating the switchover, however, was the fact that MK-3 enables users to eliminate process steps that were once critical for previous generations of the technology. For example, the brine injection system required for the MK-2 is no longer needed to regenerate the resins. That meant a technician no longer needed to engage in the weekly task of filling the system with salt water at a concentration appropriate for the feedwater the plant treats. With the change to MK-3, technicians no longer need to fill the system with salt water on a weekly basis. In addition, the concentrate recirculation loop that continuously pumped water in the MK-2 is no longer needed because the MK-3 can start up with only feedwater pressure. Eliminating the recirculation pump is a significant contributor to the nearly 50% reduction in power consumption for the latest generation of EDI equipment, which might seem minor to a plant generating as much as 500 mW annually but nonetheless impacts the bottom line. In fact, the reduction in operating costs is a significant driver in growing use of EDI, which is a function of how the technology works. EDI is based on the same principles as traditional ion exchange. Resin beads exchange salts in cation and anion form for hydrogen and hydroxide. However, the regeneration of the resin is different. EDI regenerates the resin beads continuously using electricity. Splitting water at the surface of the resin beads creates hydrogen and hydroxyl ions, which continuously regenerate the ion-exchange resins. This eliminates the need for chemicals to regenerate the resins. Furthermore, it eliminates the batch process that requires traditional ion exchange to be off-line from time to time during regeneration, often at off-site locations. This explains why EDI is a suitable choice for remote locations. Additionally, because the resin beads do not require backwashing or fluidized beds, they do not need to be installed in large pressurized tanks. And because EDI equipment require less resin for a given flow, the equipment size is smaller. Counter-current flow is another source of efficiency in the latest EDI technology. The dilute resin bed gets the highest concentration of divalent ions at the entry point. However, the concentrate flow starts at the opposite end of the resin bed. This means the highest concentration of divalent “scaling” ions are transferred to the outlet part of the concentrate chamber instead of the inlet. This method provides a two to four times reduction in scaling potential compared to the co-current method, saving chemicals with less frequent cleanings. Two mechanical technicians and a computer technician visited the facility to ensure a smooth installation and configuration of the water purification system. To ensure the EDI system fulfilled plant management’s expectations for efficiency, MPW deployed two mechanical technicians and one computer technician to the facility for the installation and reconfiguration of its water purification system. The plant supplied one worker and a forklift truck to assist MPW. 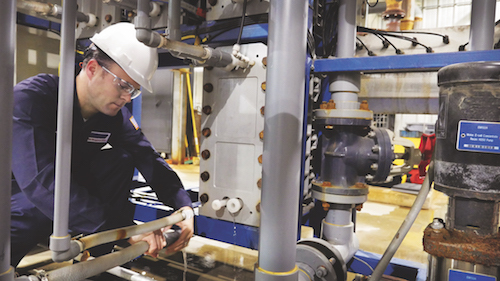 Eliminating the brine injection and recirculation systems was relatively simple; connecting the new EDI system with pretreated water was a different story. 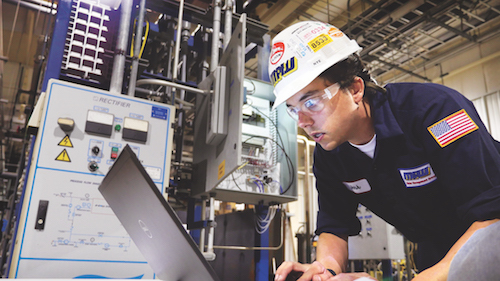 The EDI system needed to be connected to the plant’s reverse osmosis (RO) unit, which is one of two pretreatment steps for the well water that supplies the plant. (The other pretreatment process is multimedia filtration.) As a result, MPW engineers developed detailed drawings for the installation of pipes from the RO unit to the new EDI units. To meet the power plant’s need for 120 gal of water per minute (gpm), MPW’s engineers, working in conjunction with counterparts from Suez Water Technologies, determined that two rows of nine EDI units, one above the other, would meet requirements. EDI systems in power plants typically treat water between 40 and 700 gpm, though some facilities use the technology to treat water flows as high as 2,000 gpm. Removal of the brine injection system and recirculation pump, and installation of the new EDI units required two days. Another two days were required to program the system, largely because the power plant wanted to continue using its 1980s-era programmable logic controller (PLC) to operate the water purification process. Recognizing this requirement during the planning stages, MPW obtained an older-model laptop so it could communicate with the PLC. MPW completed the replacement and upgrade of the EDI system one day early, avoiding any delay in the generation of electricity due to the system upgrade while providing the capability for the continuous supply of deionized water. And for plant management, the planning and preparation for the installation and retrofit made the switch to the new EDI system seem no more complicated than the changing of a light bulb or the resetting of a circuit breaker.